Pensioners are the happiest people in Britain, new research suggests. A report by the new economics foundation shows that the over-60s have the best quality of life, while those considered 'middle-aged' in their forties and fifties are the least content. The research suggests that instead of the ageing process being depressing, older people in the UK are more likely to be booking seniors travel insurance for a holiday, enjoying a hobby or simply living life to the full. 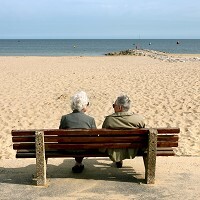 Saamah Abdallah, a senior researcher who worked on the study, said Britain seemed to be getting it right when it came to retirement, something other countries were failing to do. He said in many countries, older people had the lowest levels of happiness. But he warned that Britain should not become complacent and work still needed to be done to avoid inequality among the older population and to make sure those with a disability also have a high quality of life. The report used the latest official figures from the Office for National Statistics. The Government is currently getting ready to make a new set of figures public which are designed to measure and demonstrate people's quality of life. Prime Minister David Cameron started the initiative, known as the Measuring National Wellbeing programme, to calculate how content the population is.